Just like our earth revolves around the sun, the moon does it with earth and hence it is the only natural satellite of earth. The image of the moon as depicted in our eyes on earth is configured by the gravitational tides. There is tidal interaction between the moon and the earth. To earth the moon is the nearest cosmic body in space. It is speculated that the earth, with all its gravitational might, has been impeding one-time quick rotational movement of the moon so much so that it attained a constant rotational effect as of now, i.e. some 29- ½ days to complete one round about its axis. With such a slow speed of rotation coupled with a peculiar tilted angle of rotation, such that the head of the line of axis (line passing through the pole facing earth) if virtually extended toward the earth, it will pass through its centre; consequently we all over the world happen to see just one side of it while it’s taking round of the earth. To put it in a different way for the sake of convenience of understanding, it may be so described that the gravitational pull of the earth falling at the surface of the moon at right angles has considerably retarded the rotational movement of the moon about its own axis to a point where now it has been synchronically locked with earth in consonance with earth’s gravitational pull. This means that the speed of rotation of moon was quite faster than the one measured to date. Why do we see only one side of the moon, can be understood with the help of a simple example. Take a spherical object and paint half of its sphere with a colored shade. Now hold it in one of your hands such that the shady portion faces your other hand being held as the earth. Next, with the ball form a circle around your hand, taken as earth. It will be noticed that the shady portion of the ball faces your hand throughout the course of the circle. This proves how the moon performs both rotations, about its own axis and around the earth, yet facing one side constantly toward the earth. The same procedures can be accounted for the real moon and the real earth. So it can be inferred that there is just one face of moon visible to us, but this doesn’t imply that the other side is dark, rather, the sunlight keeps falling on it over the course of its revolutions around the earth. 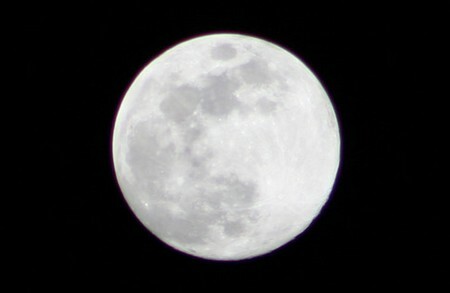 In case the moon didn’t spin every side of it would be visible on earth over the course of its taking round the earth. We happen to encounter different phases of the moon. For example some times a part of moon lit by the sunlight is visible to us, whom we call a full moon; however, at other times we see still smaller parts of the moon illuminated by the sunlight, commonly referred to as “crescent moon”, also “half moons” or “gibbous”. But whatever the phase of moon we are seeing; it’s always the same one side.